This felt quite surprising to me since, well, the match is so simple — why isn’t the compiler already generating optimal code for it? Most of my career has been on the web, which is a gazillion layers of abstraction away from what the hardware is doing. Since I’m trying to develop mechanical sympathy, I thought this would be a fun problem to dive into. What sticks out here is that the match is always faster than the lookup, except when inlining comes into play, and even then inlined lookup is only faster in the “mix with rotate” task for alphabet sizes of 4 and 8. Based on this benchmark, the question we’ll be diving into is: What’s different about 4-letter inlined match/lookup between “mix” and “mix with rotate”? To get the inlined results, I copy/pasted all variations (see the benchmark source). I couldn’t figure out how to run the benchmarks using my own Rust program (instead of cargo bench), so I manually cleaned up the results printed to the terminal1 and generated graphs in R.
I posted this question to the Rust user’s forum, where someone suggested that I look at the generated assembly via the Godbolt Compiler Explorer. I decided to start by looking at the simplest functions: match and lookup with a 2-letter alphabet. cmp dil, 66     #compare dil with 66, which is ASCII 'B'. sete cl         #if comparison was equal, set lowest byte of the rcx register to 1.
cmp dil, 65     #compare dil with 65, which is ASCII 'A'. mov eax, 1      #move 1 into eax, which is lower 32 bits of rax. cmovne rax, rcx #if comparison was not equal (i.e., dil wasn't 'A'), move rcx into rax. movzx eax, dil              # moves 1-byte dil into lowest byte of 4-byte eax. .asciz "\000\000..."        #a string with 8188 characters; each \000 is a byte, so there are 2047 total bytes here. which are the values 1 and 2 in 64-bit little-endian. Since ‘A’ is 65 and should map to 1, this must be how Rust has compiled the lookup table into assembly. For this analysis, I used these references on x86 architecture and instruction set. See the original post for more discussion on assembly. which compiled to a lot more assembly — and it wasn’t clear that wading through it all would lead to a satisfying answer. Looking at generated code is neat, but perhaps not that helpful without knowing what to look for — it’d help to have a hypothesis. In the benchmarks, inlined match and lookup have basically the same performance, except for “mix with rotate” when the alphabet size is greater than two. My hypothesis is that there is some optimization that applies to the lookup but not the match code in this specific case. my CPU translates this machine code into, uh, microcode? the microcode controls, uh, transistor switches and other electrical stuff? My friend Jamie Brandon suggested that instead looking at the assembly (third step), I look at the optimized LLVM IR (second step), since that would probably show the “big picture” of memory access and branching, without the details of specific hardware instructions, registers, calling conventions, etc. This reasoning made sense, both in terms of understanding this specific case and in terms of personal skill investment. I.e., knowing LLVM IR will be more useful (for me) than knowing the quirks and features of the x86 instruction set. So, to test my hypothesis, lets going to look at the generated LLVM IR and see how it differs between the two cases we’re interested in (4-letter “mix with rotate”). Before we get to the complex “mix with rotate” case, lets start again with the simplest match2 and lookup2. to generate LLVM IR in a file match2.ll. You can also generate IR from Rust via an online playground. means that the register %switch.selectcmp1 has a 1-bit value of 1 if %x is equal to 65 and 0 otherwise. If the input %x is less than 69 (AKA, before ASCII ‘E’), then we branch to switch.lookup; otherwise we know it’s out of range and we can branch to %bb6 and just return 0. In the switch.lookup, the byte with value %x - 65 is “zero extended” (add a bunch of zeros to the front until it’s as big as an i64), then the value is incremented2 and returned. %s.1 is an i64, that’s the actual length of the array — after all, our Rust function takes one input of type &str — “string slice” — and a slice is “a view into a block of memory represented as a pointer and a length”. The phi instruction returns a value based on where we just came from. If we ended up here from the %start block, then phi returns 0, which we then return. This is what we want — for a blank string, we don’t need to loop over anything, just return the initial value of the sum variable: 0. First, %1 is set as the address of the first byte of the slice3. (See the getelementptr FAQ if you’re wondering why it takes so many arguments to calculate this address.) The %1 register is not used in this block, but we’ll see it later. Likewise, the %xtraiter register is set (copying 1s and 2s bits of the array length %s.1) but not used until later. Finally, the block branches on whether the array length4 is less than 3. The first thing that stands out is the repetition of familiar code: it’s the lookup code we saw earlier, repeated 4 times. This is an optimization known as loop unrolling. The idea is that a loop body tends to execute many times and overhead related to iteration counting and branching (the last three instructions) can be reduced by running only every, e.g., 4 loop bodies rather than on each body. Interestingly, if we look at this repeated group of 6 instructions, the first instruction looks up the address of a byte from the input array, but this address isn’t used until the next group. E.g., the %10 register is set in the first group, but used in the second group. I have no idea why this is. That the loop has been unrolled into sets of 4 explains why the 1s and 2s were subtracted out earlier — so that %unroll_iter is a multiple of 4.
which completes the remaining iterations by branching back to itself and then finally to %bb5 to return the value. Phew! That was a lot of code, but hopefully you caught the gist. How does match version compare? From what I can tell, it’s quite similar. The only thing that stands out to me is that the loop unrolls into 2 bodies per iteration rather than 4 bodies5. which…isn’t that helpful? I mean, the diff looks like exactly what I’d expect: the lookup version has the lookup code inlined, and the match version has the match code inlined. which shows the same situation (the only difference is that the rotation code is missing, as expected). So perhaps the difference really isn’t detectable at the level of LLVM IR and we need to look at the emitted assembly? Again, nothing really jumps out here. The match code is 5 instructions longer than the lookup code — that’d explain things if match were consistently slower than lookup, but that’s not the case — match is only slower in the “mix with rotate” task for 4 and 8 letter alphabets. It’s also worth noting that this disproves my original hypothesis that some optimization applied to the lookup but not the match code. As far as I can tell, basically the same code is getting generated “around” the match and lookup in all cases. Maybe the issue is that these extra few instructions in the loop body end up keeping the match “mix with rotate” instructions from fitting in a cache line? Nope, doesn’t seem like there’s any difference in miss rates between the 4-letter “mix” and “mix with rotate” tasks. At this point, I was starting to doubt whether it’s possible to reason about performance at all. I decided to revisit my assumptions and re-run benchmarks. 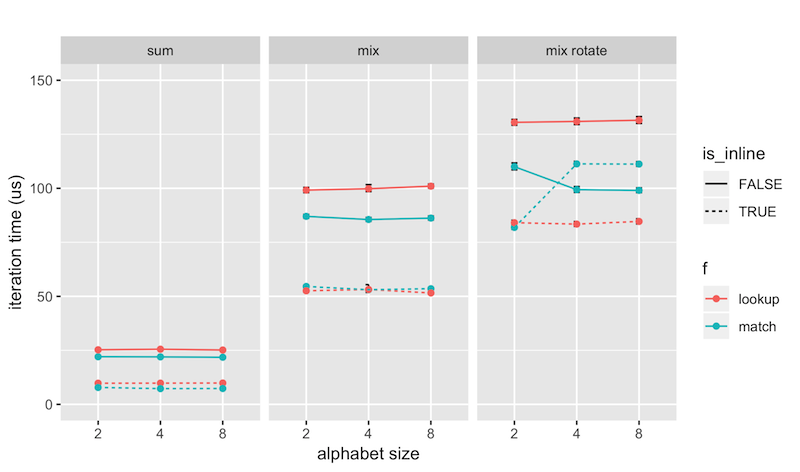 After much whirring of fans and angry reformatting of Criterion output into R for analysis, I made a startling discovery: The 2-to-4-letter inline match “mix with rotate” slowdown disappears when lazy_static is not used. That makes sense, since there’s a bit of overhead to access the lazily initialized value. After all, it was my desire to avoid wading through this extra lazy_static generated code that prompted me to write out the lookup table with all 256 values explicitly. To my great shame and embarrassment, it did not occur to me to benchmark everything again after making that change. We could go deeper on this explanation — after all, we still don’t know why Rust/LLVM doesn’t automatically convert the match into a lookup table. Another question (one which I find more troubling) is why lazy_static makes the 2-alphabet match “mix with rotate” faster. After all, the match code has nothing to do with the lookup table, so it shouldn’t be touching any lazy_static code whatsoever. As we can see from the benchmarks, though, there is some kind of relationship. Perhaps Criterion doesn’t sufficiently isolate the functions under test? Or lazy_static enables some kind of optimization that only speeds up the 2-letter “mix with rotate” match task? to be the same as just %foo. If that’s true, why does Rust bother to emit this getelementptr instruction at all? If not, what am I missing? compared to the lookup’s 6, and so hits some “loop unrolling instruction count” ceiling?